This paper describes a case study of how the University of Edinburgh gathered information about open access Article Processing Charges (APCs) that were paid by its affiliated academic authors, with particular emphasis on identifying those APCs which were not paid through centrally-managed funds which we colloquially call ‘APCs paid in the wild’. We estimate that these costs could account for up to 20% extra in the total cost of publication that is not currently being accounted for. This additional cost is important to take into account when institutions are negotiating fair offsetting agreements for open access publishing. 1. Approximately 50 or so Institutions in the UK that do not receive a RCUK grant. In the 2014/15 financial year RCUK funded 107 institutions (RCUK, n.d.) ; However, there are at least 163 universities & higher education institutions listed in the UK (Wikipedia, 2016). 2. APCs paid by authors from other sources. This includes APCs paid by industrial sponsors or local departmental budgets. This study focuses on the second grouping we are calling ‘APCs paid in the wild’ – a term we believe was initially coined by Neil Jacobs at Jisc. In our context these APCs paid in the wild are important because the identification of them will lead to a more accurate picture of total APC expenditure for our institution. It will also help identify local grants that can be reimbursed, and potentially identify uncompliant journals who are ineligible for RCUK/COAF funding. The first approach we took to identify APCs paid in the wild was to use data sourced directly from the University’s finance systems. Our initial method was to query and return all transactions with the official finance account code allocated for open access. In theory these transactions can then be traced back to corresponding invoices through which it may be possible to match to an individual article. If this is not possible because matching article information is not available on the invoice, then the associated cost centre and job codes can identify the specific department and research grant the APC was paid from. With the date/publisher information on the invoice and the grant information it should be possible to identify the corresponding article via information hosted on our Current Research Information System (CRIS).The preliminary results suggested that, apart from Information Services who are operating the open access block grants from RCUK and COAF, there is no unified coding rule for APC payments and code selections depend on particular grant, centre or school budgets. Thus, it was not possible for us to identify APCs paid in the wild in this way. The second methodology we tried was to collate reports from the Finance department for payments to specific publishers during 2015, and identify those that looked like APC payments by the transaction amount. The corresponding invoices could then be cross-referenced against our APC database and we could remove any duplicates. The remaining APCs paid in the wild could then be linked to papers by correlating the date and finance job code with publication and grant award information held on our CRIS. Unfortunately for us the timing of our work clashed with an extremely busy period in the Finance department and understandably we weren’t able to secure the data within the timeframe we required. We hope to revisit this work in the future to see if we can extract any useful information. Due to the problems described in the previous section we then decided to test if it is feasible and desirable to gather information about an institutions annual open access publishing profile directly from an online database. To do this we wanted to select a platform that allowed search terms to return a list of articles filtered by time period, affiliation, open access status and publisher (for potential cost analysis). The largest databases (e.g. Web of Science, Scopus, and Google Scholar) do not offer filtering by open access status or publisher, so for the purposes of this study we selected Elsevier’s Science Direct platform. This decision was influenced by the fact that the biggest expenditure from the University of Edinburgh’s combined OA block grants was with Elsevier so any search should return the largest pool of results. In 2015 there were 493 APCS paid by the University of Edinburgh’s RCUK and COAF block grants, of which 101 APCs were attributed to Elsevier journals which accounts for 20% of the APC which are administered by the Library. This figure is similar to that reported by other institutions and organisations - 21% from the Wellcome Trust open access expenditure in 2014/15 (Kiley, 2016). The search [Affiliation = University of Edinburgh, refined by Open Access status = true, item type = article, time period = 2015] returned 348 results on 01/03/2016 . The full citation list was exported as a text file and DOIs extracted. The articles were then individually analysed to remove remaining non UoE papers, to identify University of Edinburgh corresponding authors, to determine whether funding was facilitated via the University of Edinburgh (internal) or another institution (external), and to recognise funders in the cases where the article was authored by a University of Edinburgh corresponding author, and the funding was confirmed to be internal. In total, it took one hour to run, filter and de-duplicate the search results, then six hours to analyse 260 individual DOIs. Unfortunately the affiliation search produced a large number of false positive matches (n=88). The Science Direct platform searches the text in the authors address information to match the input search affiliation terms. Due to the occurrence of the name Edinburgh in the address field it has also picked up authors associated with a wide range of institutions based in Edinburgh, for example Heriot-Watt University, Queen Margaret University, Edinburgh Napier University and Scotland’s Rural College (SRUC). These results were noted and set aside. 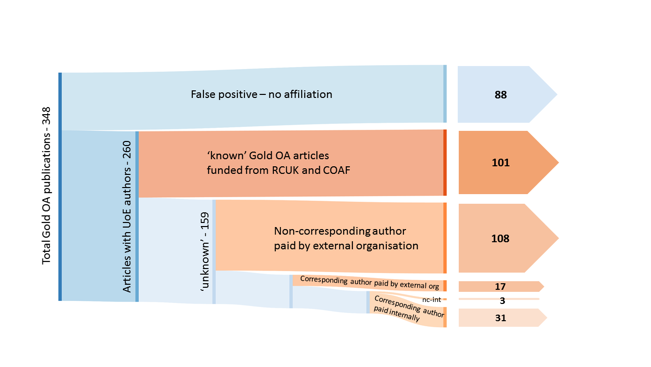 Data was then extracted from four reports previously submitted to research funders - the 2014/15 and 2015/16 RCUK and COAF compliance reports - to give details of all Elsevier Gold OA articles published in the calendar year 2015 that were supported by open access block grants awarded to the institution. This list of ‘known’ Gold OA articles (n=101) was then removed from the results to give a list of ‘unknown’ Gold OA articles remaining. Each of the articles on the remaining list were individually accessed and the corresponding author identified. The Science Direct platform names the major funders who enabled the Gold OA so it is possible to positively identify where the APC was paid by another institution (n=108). The key identifying criteria being the lead corresponding author is based at another institution and the APC is not on our ‘known’ gold OA list. We could further identify the situation where the corresponding author was based at the University of Edinburgh, but the gold open access was facilitated by another group or body (n=17). All of these identified articles were conference proceedings where the entire special issue has been paid to be open access by the conference organisers. These publications do not even consider single articles from individual authors, for example Energy Procedia. This method of funding open access for conference proceedings seems to be becoming extremely popular for subject disciplines like Engineering and Computer Science. The final group (n=31) consisted of articles where the APC was paid by the University of Edinburgh, but the corresponding author paid for it from sources other than the central block grants that the Library administers. We also identified a sub-group (n=3) where a non-corresponding author paid to facilitate the gold open access. It was possible to spot these because a UK funding organisation visibly paid for the gold open access (e.g. as shown in Fig. 2), but all of the authors were based at foreign institutions apart from the one University of Edinburgh co-author. In this case it is reasonable to assume the Edinburgh author paid for the APC. Together this grouping of previously unknown institutionally paid gold OA articles is referred to as ‘APCs in the Wild’. The largest portion (59%) of the Elsevier ‘APCs in the Wild’ group were RCUK (15) and COAF (5) funded. For one reason or another these costs were paid directly from research grants and not from the institutional block grant. With further investigation it may be possible to reimburse these research grants. Nearly a quarter (24%) of the group was made up by research funders, CSO (4), ERC (2) and DoH (2), that have funds available to researchers - either post-grant awards that researchers can apply for, or budgeted as direct costs in the grant proposal. These costs are currently not tracked by the institution, but it may be possible to configure a report in our Current Research Information System (CRIS) to gather this data. It is interesting to note that industrial sponsorship of open access seems to be relatively small - we detected only one case of this. In three of the articles it was not possible to determine funding sources without contacting the corresponding author directly. If we can assume that Elsevier represent approximately 20% of the APC market – which as discussed before is a reasonable figure – then we can speculate on the bigger picture. As such we would expect that there could be as much as 170 APCs paid at the University of Edinburgh in 2015 that we are not currently aware of. This could potentially be as much as £325,000 not being accounted for in the various offsetting agreements for open access publishing being negotiated at the University of Edinburgh alone. Offsetting agreements are important, and will increasingly become more so, as academic institutions begin to face a rising ‘total cost of publication’ – this is where you take into account subscription costs plus APCs and other additional administration costs like staffing. Jisc Collections have published a set of ‘Principles for Offset Agreements’ (Jisc Collections, 2015) which describes a series of recommendations for both publishers and academic institutions to improve and evaluate the offset systems. To support a managed transition to fully gold open access then all parties need to be aware of all of the costs, which includes APCs ‘paid in the wild’, which we have illustrated here could account up to 20% more in the ‘total cost of publication’ than previously thought. So what can we do about this? Being aware of the problem is a good first step from which we can then act and design better methods to identify and evaluate the true costs involved. We would recommend that when institutions are looking at negotiating open access offsetting deals with publishers that they don’t just rely on known costs from the central open access funds that they manage, but that they also try to quantify and include the cost of APCs paid in the wild, which will give them a more accurate picture of the total cost of publication. Thanks for sharing this useful analysis and apologies for late feedback. After doing a much less comprehensive analysis of the APC mgt landscape at U Strathclyde, I would argue that this 20% figure is probably a severe underestimation of the amount of APCs paid in the wild. This percentage will of course show large variations across HEIs depending on factors such as the quality of the dissemination on OA funding opportunities and workflows carried out towards authors, the quality/speed of the APC payment process and whether or not there is an additional institutional Gold OA fund available to support such workflows. The UoE will probably be among the institutions with lower rates of APCs paid in the wild, but it's probably higher than 20% because Elsevier is far from being a representative example that can be extrapolated to collect a wider snapshot. Precisely because Elsevier is the major recipient of funding from the institutional block grants, their workflows for processing APC-funded Gold OA are quite advanced and consolidated. Partly thanks to the joint efforts of many HEIs plus the Jisc, they provide clear indications on whether a given paper is Open Access and what funder has paid for the APC fee. They easily meet the licensing requirements without requesting extra payment and they will also frequently have pre-paid accounts that make a centrally-managed funding much more reasonable. In one word, they are at home with the model. 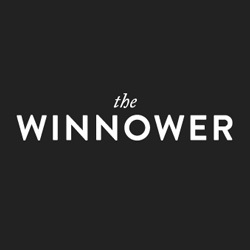 The issues start to arise the minute you move onto smaller publishers. If the OSA (just to mention one example) charge an extra fee for CC-BY, the researcher will be tempted to take the shortcut and make the payment from departmental or grant funds even if the research funder's requirements are not met. Any negotiations the Library needs to have with publishers on licensing, correct funder acknowledgement or data statements will result in a slower payment processing and will drive authors in a hurry to get their papers published to avoid the centrally-managed workflow. The speed the landscape keeps shifting this analysis may already be at risk of being outdated a few months after your text was released, mainly due to the improvement in the institutional workflows and the consolidation of the dissemination strategies, but my guess would be that the best subset to analyse for a fair estimation would be the papers published in fully Open Access journals where an APC must be paid to get a paper published. When looking at publications in MDPI, Copernicus, Frontiers and/or PLoS journals, our own estimations frequently show rates of APCs paid in the wild well above 50%, partly because researchers seem to be unsure of whether APCs for manuscripts accepted in such journals are eligible for funding. This is the kind of misunderstanding that may easily be tackled with a more effective dissemination strategy. It would make sense however to repeat the analysis you present on a yearly basis in order to make sure that these rates are under control. I hope these thoughts may be useful even after so many months after the original text was published. Thanks.